Okay, first of all, a small note: I get 'Fables' now. Oh yeah I do! I have been chomping my way through comics like some kind of demented, ginger Pac-Man and I want to share with you the ones I think you should be reading too. First off, have any of you out there heard of Global Frequency? No? You make me sick! 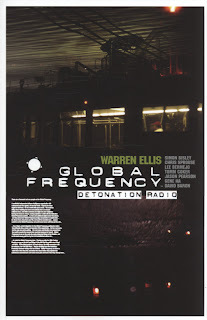 I recently picked up Global Frequency: Detonation Radio. The 'Global Frequency' is a special response team made up of 1001 members. These memebers are experts in various fields, ranging from Free Running and martial arts, to biological and chemical warfare and the occult. The lady in charge is Miranda Zero, she is calm, cool and always in the know. Connecting everyone to everyone else is the ever present Aleph; a genius, punkette of sorts, with a talent for multi-tasking. If you get a call from either one, then you're on The Global Frequency. In two of the short stories within Detonation Radio, both Miranda and Aleph find themselves under fire. Often, as with Detonation... alot of the stories have no title, so it is difficult to recommend certain tales. But they are all written by Warren Ellis, so you're always going to get a good read. The artists chosen are an eclectic bunch; Detonation Radio boasts artists such as Jason Pearson, Gene Ha, Tomm Coker, Chris Sprouse and Karl Story. Pearson illustrates my favourite short of the bunch: 'Aleph', in which Aleph finds that, for the first time ever, the GF Central Hub (her home) has been infiltrated, and she is forced to act on her own.